This Valentine’s Day, love your heart! Have you heard of phenols, flavonoids, and antioxidants? Phenols and flavonoids are families of phytonutrients, nonessential nutrients found in plant foods that provide color, flavor, and health benefits, particularly as antioxidants. In the body, antioxidants inhibit molecules that cause damage to body cells. Because of these antioxidants and other nutrients, increased fruit and vegetable consumption has been linked to decreased risk for many chronic illnesses, including heart disease, cancer, and neurodegenerative diseases. Does this mean pears are good for your heart? Well, a systematic review of pears and health published in the November/December 2015 issue of Nutrition Today supports what I’ve been saying all along. To be specific, pears contain many nutrients, including fiber, vitamin C (an antioxidant! ), potassium, and phytonutrients that act as antioxidants – in particular, pears provide between 27 and 41mg of phenolic compounds per 100 grams (1 small pear). Many antioxidants are found in pears, and those with high phenolic and flavonoid contents – such as the anthocyanin in the skin of red pears – had significantly higher antioxidant and anti-inflammatory abilities. Does this mean that pears may fight heart disease? It’s possible. One study by Mink et al included in the review found that dietary intake of foods rich in flavonoids, particularly pears and apples, was associated with a reduced risk of death due to cardiovascular disease. 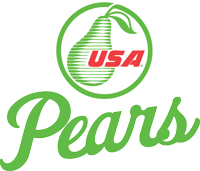 Did you know that the Anjou and Red Anjou pear was recently certified as a Heart-Healthy Food by the American Heart Association? So this Valentine’s Day when you and your loved ones are surrounded by love and candy hearts, do something good for your actual heart and eat a pear! This entry was posted in Nutrition and tagged Amy, Anjou, athlete, exercise, health, heart health, Nutrition, pears, Spring by Amy Kweller MS, RD. Bookmark the permalink.